I have the ikea mamut table I think it is called. All day long I'm pulling one child off the table or picking up the chairs from kids tipping them over. So my question is: does anyone else not like this table? I'm considering either getting rid of the chairs completely or getting a different table/chair combo. Any thoughts or suggestions? I've ben wanting to buy that table and chairs for ever now and just haven't made my way to IKEA yet. I take it, the table and chairs are easily to tip over? 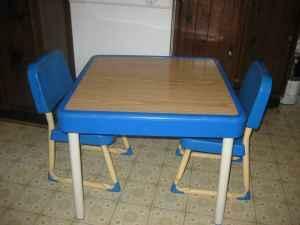 I have a big oak stop sign shaped table with matching oak chairs in my kitchen area (DH made it so SUPER heavy and sturdy) but I have two Fisher Price tables in other rooms and I like them but I've had them forever so I've been meaning to buy the IKEA ones instead. Table is pretty sound. I have the round one. But chairs, omg, yes constantly tipping backwards. Not so much with children in them but you can bump them the wrong way and back they go. So I'm kind of wanting to switch this one to my sons room and then something sturdier for playroom. the center I worked in had those in every room. I was not a fan... the tables cleaned up easily (could use a magic eraser on them if needed), you were able to move them around easily, they didn't tip over, but overall I just didn't care for them. The chairs were easily tipped over and the bottom pieces of the leg would pop off. There were some chairs where the leg completely broke off. I wished that they had gone with traditional "school chairs and tables." In my (small) home daycare, I do have an ikea children's table. It is a small wood one called Sundvik in white. I don't love it, but it works for my small numbers as a play table for two or three. I'll be honest - I let the children sit on my table and stand on the chairs. If the chairs fall over I leave them or ask the children to pick them up. In over a year of this no one has been hurt and my frustration level has gone way down because I'm not constantly saying "get down" "get off the table" "don't stand on the chairs", etc. Even the 15-month-old who isn't walking yet can climb onto the table and off again safely. I have these table and chairs. I have the circle one and the rectangle one. I also have eight chairs. We have a love/hate relationship. Cute and all, but yes the chairs tip so easy. I do not have mine in the play room, only in the kitchen, but if you walk by them and bump them so slightly the chair tips. I have put them in the playroom for a table activity or writing etc. before, but it is not long before the chairs are tipped over and the boys are sitting in between the legs using it as a tank. or one leg here another over there and so on. but they are easy for the kids to move in and out, so sometimes the chairs get taken into the playroom for a train or airplane ride and the rectangle table often becomes a bridge/tunnel. The legs on a few pop out sometimes too, but I cannot complain since I have had them all for 6years and they are still in good condition. I would however in the future get the long rectangle or horseshoe table from discount school and the stacking chairs, but until then. In theory I don't mind table climbing except that it is a 14 month old doing all the climbing here. But she also climbs the dining table and chairs and has already slipped and bumped her head. I hunted craigslist til I saw the land of nod activity table. Very sturdy, great storage and it came with the four wooden chairs. Love it! The chairs don't tip over and the table is high enough that it doesn't beckon climbing. I haven't owned these tables or chairs, but you said the legs will sometimes pop off. Are the legs hollow inside? If so, what if you put sand or a similar material inside to weigh it down, would that help prevent tipping?